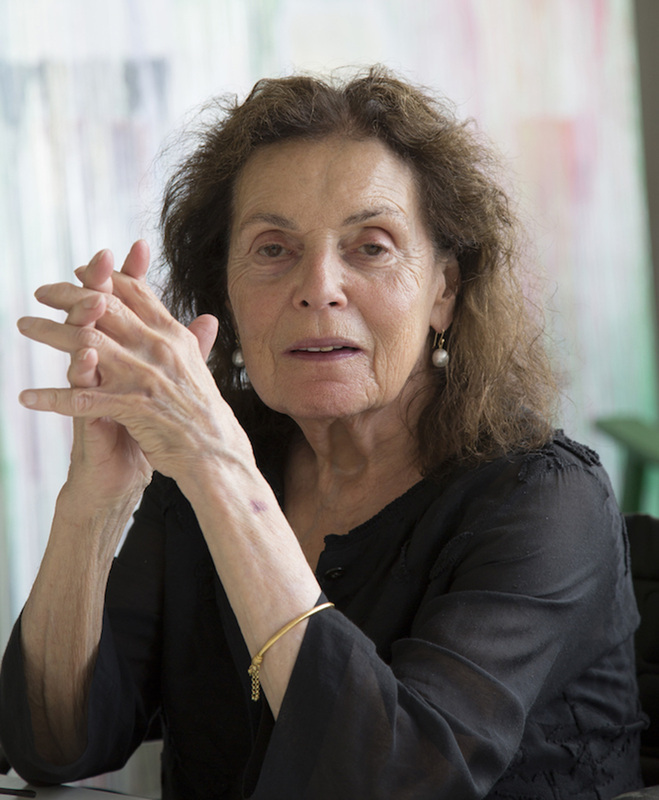 The Hirshhorn Museum and Sculpture Garden will present the largest site-specific exhibition to date by the acclaimed abstract painter Pat Steir. Organized by Evelyn Hankins, the Hirshhorn’s senior curator, the exhibition is an expansive new suite of the artist’s signature “Waterfall” paintings, spanning the entire perimeter of the museum’s second-floor inner-circle galleries, extending nearly 400 linear feet. On view Oct. 24, 2019–May 10, 2020, Steir’s immersive works will transform the museum into a vibrant spectrum of color. The 28 large-scale paintings, when presented together as a group, will create an immense color wheel that shifts hues with each painting, with the pours on each canvas often appearing in the complementary hue of the monochrome background. Over the past four decades, Steir has produced a commanding body of abstract paintings that draw on the artist’s distinctive method of combining meticulous brushwork with multiple layers of drips and pours, simultaneously carefully calibrated and apparently random. Drawing on motifs from Chinese ink painting and gestural abstraction, Steir’s “Waterfalls” are formed by brushing and pouring multiple layers of paint, allowing gravity to guide the cascading forms. As her most quintessential abstractions, “Waterfalls” echo the metaphysical ideas of harmony with nature expressed in Zen Buddhist and Daoist thought, even as they redefine the conventional flat picture plane to sculpt deep, transcendent space. At the Hirshhorn, the suite of 28 paintings will activate the entire gallery as visitors walk around the space, exploring the wheel’s spectrums. Moreover, Steir’s paintings will create a dialogue with the Gordon Bunshaft-designed outdoor fountain and seasonal changes visible through the museum’s windows. Born in Newark, New Jersey, in 1940, Steir studied art and philosophy at Boston University and earned a Bachelor of Fine Arts from Pratt Institute in 1961. Over the past 50 years, she has exhibited extensively in America and Europe, with solo exhibition at institutions such as The Whitney Museum of American Art, New York; the Albright-Knox Gallery, Buffalo, New York; Gemeentemuseum Den Haag, The Hague, The Netherlands; P.S. 1 Contemporary Art Center, Long Island City, New York; The Irish Museum of Modern Art, Dublin; Musee d’art Contemporain, Lyon, France; the Brooklyn Museum of Art, New York; and Rijksmuseum Vincent Van Gogh, Amsterdam, among others. Her most recent solo exhibition took place at Lévy Gorvy, New York in 2017. Select public collections include Louvre, Paris; Tate Gallery, London; the Metropolitan Museum of Art, New York; the Museum of Modern Art, New York; the Philadelphia Museum of Art; the Whitney Museum of American Art, New York; the Solomon R. Guggenheim Museum, New York; Denver Art Museum; the Brooklyn Museum, Brooklyn; the Baltimore Museum of Art, Baltimore; National Gallery of Art, Washington, D.C. and the Hirshhorn Museum and Sculpture Garden, Washington, D.C. In 2016, Steir was elected to the American Academy of Arts and Letters and in 2017 was presented with the U.S. Department of State’s National Medal of the Arts. Steir is also a recipient of The Guggenheim Fellowship (1982). Image: Pat Steir in her studio. Photo: Jean-François Jaussaud. Courtesy Lévy Gorvy.